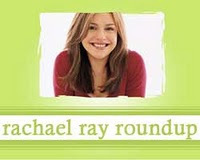 Here's the vacation edition of the Rachael Ray Roundup. We are staying in a lovely beach house and enjoying our time relaxing! I had fun picking a few recipes to make while we were here that were easy to make, easy to clean up, and utilized the grill. So far, we have had Pesto Chicken Grill Packets (I wish I was creative enough to think of more variations on this), Turkey Loco Burgers, and a non-grilled French Dip Sandwich. Tomorrow is our last full day here and Bacon-Bit Burgers with Smoked Gouda and Steak House-Smothered Onions are on the menu! Lil Sis of Big Sis Lil Sis made Toasted Orzo Chicken Soup. KSFM has some audio where Rachael Ray makes it clear she is not a fan of the KFC Double Down sandwich. The Sustainable Scribe features a review of Quesadilla Casserole (a dish I like to bring to families with newborns). Haylee of Haylee's Food adapted Rachael's recipe for Bucatini with Bacon, Cherry Tomato and Spring Onion Sauce. Karen of A Chicken in Every Crockpot made Goulash in 30 minutes. Taste and Tell's Saturdays with Rachael Ray included a review of Spinach and Artichoke Mac and Cheese. Rachael Ray is apparently a fan of Groundhog Day.